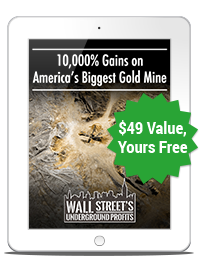 To put yourself in a position to reap maximum profits from other 10-bagger gold and precious metals opportunities, simply accept a risk- and obligation-free trial of my extremely popular advisory service, Wall Street's Underground Profits. You'll not only get 50% OFF this incredibly valuable research, but you'll also have the chance to get in early on the historic gold mine opportunity that could shortly mint new millionaires. 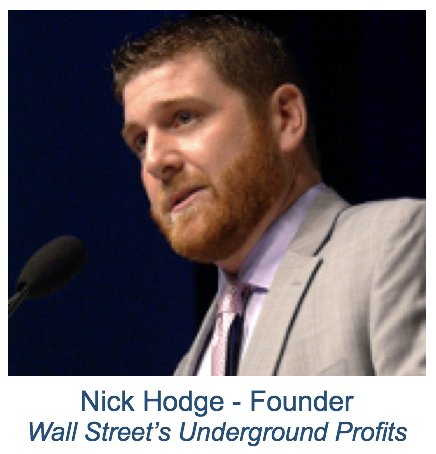 When you agree to take advantage of the Wall Street's Underground Profits offer I'm making you today, you’ll receive an incredible bundle of wealth-building tips and tools. Our Monthly Newsletter: You get 12 monthly issues of the Wall Street's Underground Profits newsletter, in which you'll discover unique investment opportunities that could consistently grow your wealth, no matter how much or how little you currently have, and strategies on how to (legally) live outside "the system." Bonus Report: “10,000% Gains on America’s Biggest Gold Mine”— This covers the historic gold mine opportunity and the unknown 75-cent miner with complete ownership, including its name & ticker symbol, footage from my recent visit, and the inside scoop you can only get from my network in the mining space. BONUS GIFT #1: “Wealth Without Risk: Growing Rich Without the Stock Market”: Ownership and control of land, food, and water are a true assessment of wealth. You should be striving to get exposure to these asset classes by any means possible. — a $49 Value, Yours FREE! BONUS GIFT #2: “Bank-Proof Your Money”: To truly take control of your finances, you need to branch out and get your accounts in order. In this report, Nick Hodge lays out all your options. BONUS GIFT #3: “The Secret Financial 'Hacks' of the Super-Wealthy”: It's not until you're managing your entire financial life, not just buying stocks, that you can truly maximize your wealth-building potential... here are three things you should do immediately. Special Alerts: In addition to our monthly issues, you’ll also get regular investment alerts and updates about existing recommendations and other investments I’m researching. Wealth-Building Strategies: Wall Street's Underground Profits is much more than merely an investment newsletter. It’s a comprehensive financial and wealth-building road map. Special Bonus Reports: Every quarter, I'll be adding NEW special reports to the archives... reports that could make a substantial difference in the ways you save, invest, and maintain your personal freedoms. These special bonus reports are yours FREE as a subscriber to Wall Street's Underground Profits. 24/7 Access to Our Subscribers-Only Website and Archive: Complete, 24/7 online access to a special forum where you can interact with me and other members of the community. Free subscriptions to the daily e-Letter Outsider Club and our special offer letter Outsider Club's VIP Reserve. In fact, you’ll pay 50% less than sticker price for 12 months of Wall Street's Underground Profits. Just $99. You'll also receive everything I mentioned above, including members-only access, private alerts, and 50% off pricing.